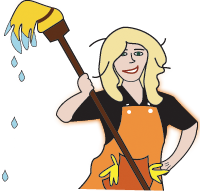 MESSY MAID Gift Certificates are a great way to treat that special someone to having their home sparkle. Whether it be Mother's Day, Father's Day, Christmas or birthday MESSY MAID can take the hassle out of the guess work. Purchase a gift certificate below or call us at 1.855.767.6243.